The following was written by R. Scott Lloyd for the Deseret News. To read the full article, click here. 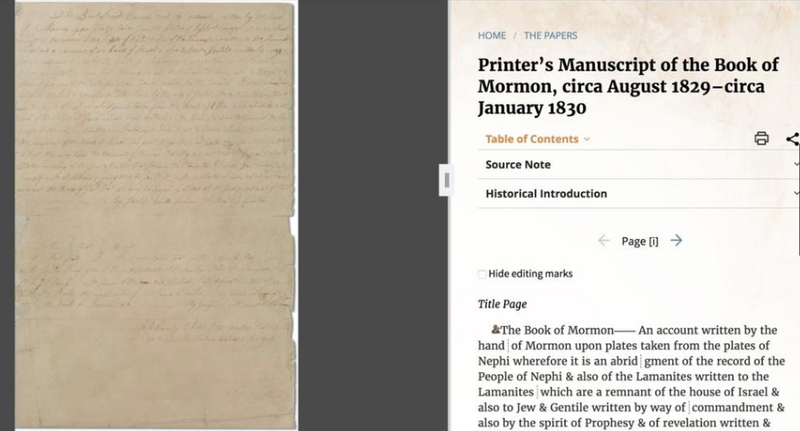 The Book of Mormon printer’s manuscript, recently purchased by the Church for $35 million, can now be viewed for free by virtually anyone in the world who has a computer with an internet connection. In cooperation with Community of Christ, the Church History Department in 2015 published the manuscript in two letterpress volumes as part of the Joseph Smith Papers project. Then, this past September, the Church announced the purchase of the manuscript from Community of Christ. Now, the manuscript can be viewed at the Joseph Smith Papers website, www.josephsmithpapers.org. Each page of the manuscript is displayed side-by-side with its accompanying transcription, which includes a detailed, color-coded reproduction of the text. All of the annotation included with the print volume is also on the website. As in the printed volume, the pages of the manuscript are presented as full-color, high-resolution images. And the user may zoom in for a close-up view of the handwriting.